The collection is created from hand-made ribbons obtained by cutting out the textile i.e. twill under 45 degrees angle. 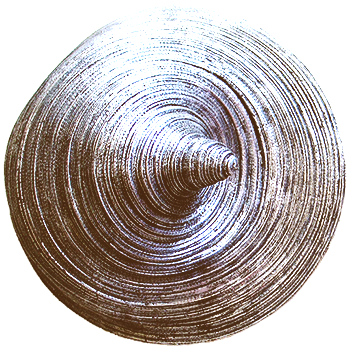 These ribbons were spirally stitched by bias-cut technique which is often applied when making straw-hats. This produced variously sized cones which somewhere step out of the body, dressing item and enter the space, while the product’s structure itself intensifies and emphasizes a tactile experience. The actual surface is unevenly treated; hence some stitches have greater density and some of them are rarer. Material treated in this manner is used to shape forms that remain functional and evoke the sculpture. An appropriate description of Josipa Stefanec's work could follow at least two discourses in visual arts critique. For instance, one would be the theory of technical-material determination of artistic forms. It would, besides the influence of textile design education on her artistic work, be used to explain the difference and transition from one ornamental art form covering a certain utilitarian object or body into another, “ideal”, form in which the entire piece is a work of art. Both aspects are simultaneously present in her work and are more easily differentiated by context in which they appear than by any other of their inherent components. The second description would follow the modernist notion of a soft shape, present in works ranging from Dali’s motifs in some of his paintings to fabric sculptures of Claes Oldenburg, felt pieces by Robert Morris or rubber and latex sculptures by Eva Hesse, etc. 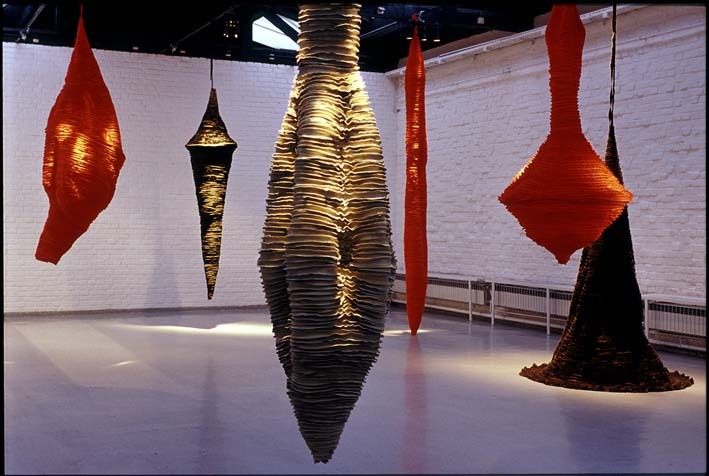 Without venturing into the meaning of their forms, it can be said that they create an artistic event in the process that incorporates their mass and its relative force, directly introducing and presenting plastic phenomenon of tectonics. The shapes of Josipa Stefanec’s work were created by sewing dyed cotton fabric ribbons, stitched in circular, or spiral, movement with accentuated stitching on its outer edges, thus creating a soft, wrinkled surface. In some examples the created shapes pick up on the iconography of draperies and further remind of organic shapes. Flexible soft material, susceptible to gravity, creates a shape that is partly dependant on coincidence and whose form cannot be projected in advance. Hanged at one end or fixed to a wall, it accepts the lack of definition provided by gravity, under the influence of which it continues to slowly and unnoticeably stretch. Initial structure is modifiable, left to its own logic, structured by its own weight, as well as by numerous configurations influenced by the manner in which it is displayed. Also, it can be presented as if it has fallen off, lying contorted on the ground. In such way these configurations can show the opposition of ascending and descending, vertical or horizontal positioning within space. More over, except when intentionally avoiding contact, the works are displayed so that they provoke tactile confrontation with the observer. The space in which they involve is not visual but physical, behaviourist space of the observer. These works can, in certain situations at least, be perceived as sculptural projects whose problems are based on mobile and active body of the observer. Evolving from clothing, this sculpture has an important relation to human body, not as its representation but as an inducer of its activities in various respects, as a tactile and visual experience, observations of its texture, fluidity, size and ratio. Without resorting to a particular thematic, the physical experience, presupposed and possibly betrayed, is the starting point for the contemplation of this work of art. 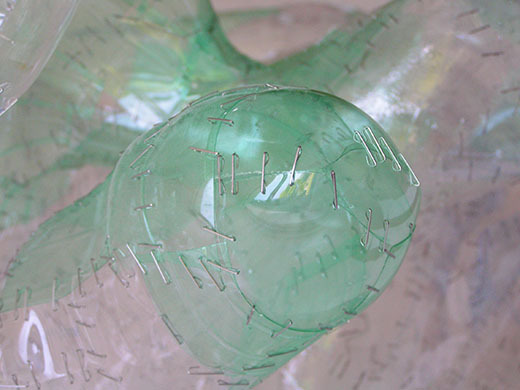 The installation "Plastic hybrids", which is created of two objects (bigerand smaller). Objects are derived from irregular pieces of plastic and are connected together. Without venturing into the meaning of forms, these works we can perceived as sculptural projects whose problems are based on mobile and active body of the observer. Objects are set to hang on the flaks, its transparency and communication between themselves, playing in the space, offering new views from every angle and lead the observers to the movement and the most delicate touch or external influences (wind) are slowly rotates them and the work become complete in that interaction with the viewer. Josipa Stefanec’s artwork Clothcatcher (2010) deals with the problem of individual memories, defined by certain places and events. 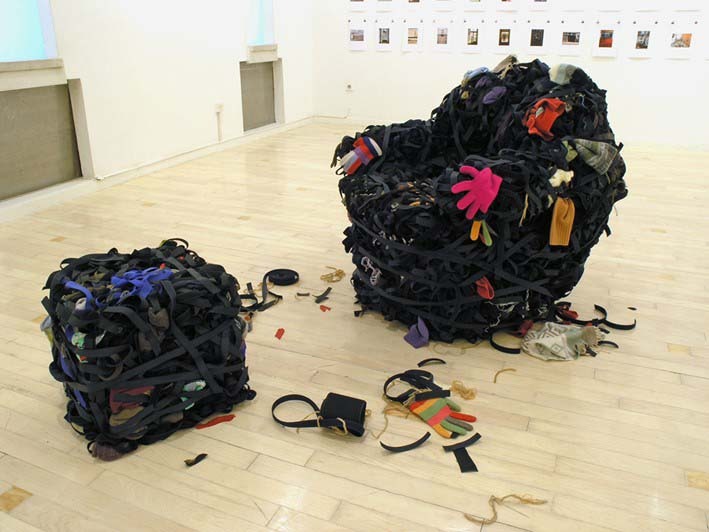 The basic constructional element of installation, which consists of an armchair and a tabouret, is Velcro, a thin strap of fabric on which random garments from our everyday life have been caught. The sticky potential of material objects “ steal” and accumulate clothes that use to belonging to different persons , friends, passengers and also include symbol of the famous idol (Michael Jackson). Objects become game of opposite line: anonymous and famous, male and female, purity and impurity, reality and fantasy… The artist has thus subtly drawn attention to the issue of accumulating commodities, which are turned into waste in our civilized society. It seems as though the form is built by everyday life and not the artist, feeding itself with identities who use to stay at the same space, living traces of specific place. Without it owners clothes looks a like reflections of alienated life, an argument without any understanding. The relief-wall installation "+ -, Opposites attract?" Josipa Stefanec deals with visual-semantic phenomenon. The work consists of a frames on which is placed Velcro instead canvas. Essence of the material is that holds frames together and adds a variety of ways how to display. Although her work is extremely hermetic , the author deals with the theme of opposing poles-male and female principles, the positives and negatives, face and back sides of things, a lost identity, mystical values and meanings of everything around us. Looking at the work imposed a question within sucked into the absurdity of a black hole, or is it just a natural process of beginning. The history of painting in the last hundred years has known a direction that has lead to reification – the materialising of a painting. 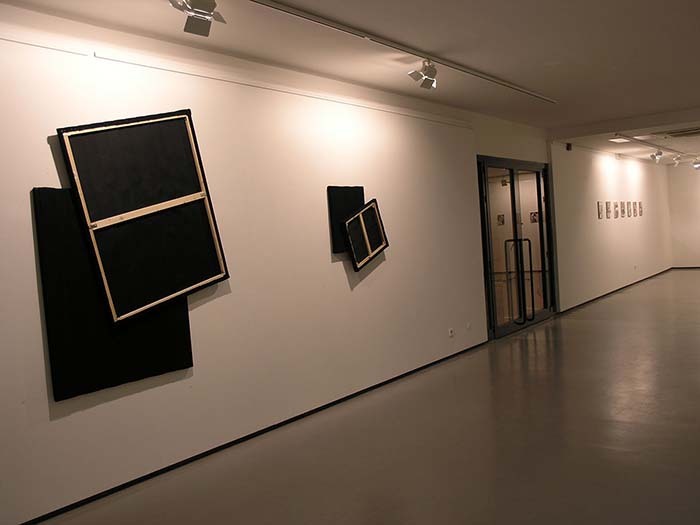 That means that after the visual art in its abstract phase renounced its mimetic function, it very soon turned to perceiving a painting as a thing among things, as a surface filled with geometrical shapes (black squares, silver lines, blue surfaces) or changing the traditional square shape of the painting surface itself. These things have a type of 'higher' or no meaning at all: some have read into them meditative qualities, as monks to spokes, and some have thought of them as material facts, as an aesthetics without meaning, as life itself. Some of the modern continuations of that path are numerous spatial installations, Arman-like accumulations of things and objects in showrooms of a visually fascinating impression. 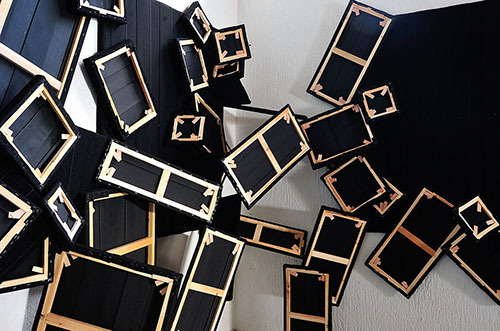 By putting Velcro instead of canvas on blind frames, Josipa Štefanec varies the traditional form of painting and creates layered black surfaces that can be glued one to another. The materials from the fashion industry have been a source of her inspiration for a long time, and in her previous work she tried to link in a visual and a tactile way the impression of soft and hard, that is of firm and decaying. That is why these 'paintings' that stick to each other, at times with minimal surface (which indicates the power of the Velcro) seem as paused explosions. The dispersion of the objects that support each other because of the type of the material in a stable collapse, as well as possibilities of the articulation of space, the transposition of mass from one wall to another, their merging in different angles and the building of a construction provides the work with a sculptural character. Although these are not paintings, the shape and construction of the canvas are a strong shaping archetype, so the association ''painting sculptures'' is inevitable. In the history of ''the painting as an object'', after its cutting and burning it here becomes a constructive, accumulative element, its shape does not have a meta - Art Informel aggression, an excessively fascinating aesthetics of violence and pointlessness, but is a unit of a ludic variation. False revolutionary breaks of 'the death of the painting' and 'the return to the painting' can also be perceived in this way, as a transition from destruction to construction. The point of this reification is actually a traditional aesthetics, the meaning in the form itself, even expression, not on a semantic or a world view level, but in decoration (like the Baroque applied arts). Velcro is a new texture, so despite the equal blackness of the surfaces there is a tactile difference between the course parts that support and the fluffy parts that are supported, which gives the work another dimension. The dirt from the surroundings gathers on the surfaces very quickly, making the object an indicator of space, giving them life, dirt and a sort of interaction, so these installations are not a sterile and lifeless design. The merge of textile and sculpture, the static and dynamic leave a space for thinking about their meaning. The temporality and the construction material promise different combinations and the author's merging of differences represents playing with tradition, with the relevant in art, and that is form and material and the possibilities they can bring. 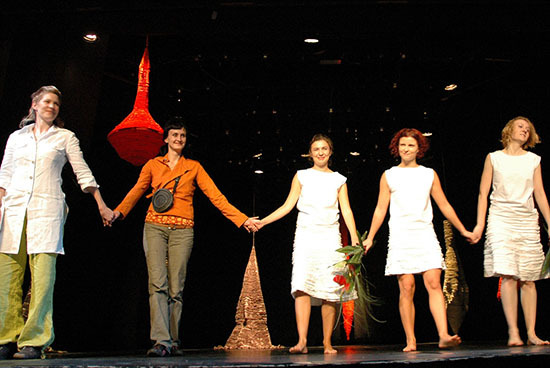 Dancers: Valentina Cebusnik, Rina Kotur, Ivana Levanic. Lighting design: Sasa Fistric, Iva Pavicic.